Bhopal: Bharatiya Janata Party President Amit Shah said here today that the BJP got people’s mandate in 2014 and the party is now ruling in 14 states. Even in states where we have not been able to form our government, BJP’s vote percentage has gone up. Focusing on the massive membership campaign launched by the BJP, Shah said that it is based on missed mobile calls and new technology. The membership drive has been highly successful and we have made 110 million members. 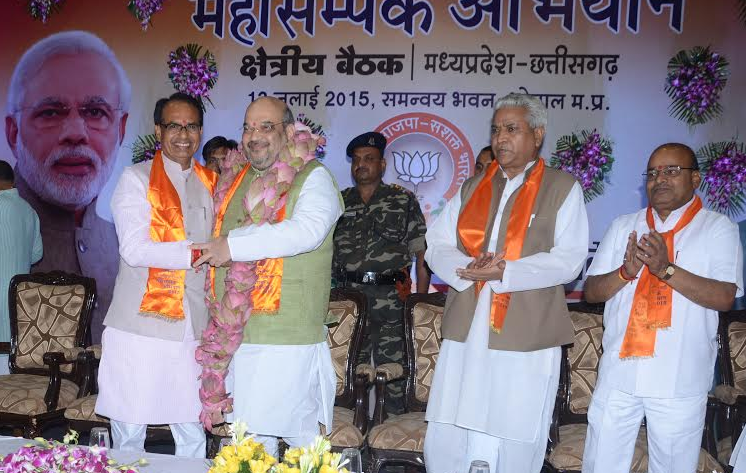 The BJP president was addressing a regional (Madhya Pradesh-Chattisgarh) party session attended by chief minister Shivraj Singh Chouhan, MPs, MLAs, ministers and other party leaders.He said that the 110 million party members can ensure victory for the party in elections but winning elections is not our sole purpose. Our objective is to turn the course of our history, make our culture more rich and vibrant and catapult the nation to the position of “World Guru”. In the context of a much discussed promise by Prime Minister Narenda Modi, the BJP president told party cadres to work for BJP’s victory in every election from Panchayat to Parliament. BJP should be in power for 25 years to ring in the “achche din” (good days), he went on to assert. Shah said that the Central Government under the leadership of Prime Minister Narendra Modi has taken 14 important initiatives. These would pave the way rapid socio-economic development. Each of these initiatives have empowered the common man. The “Jan-Dhan” scheme has given social prestige and opened the doors of the banks for the deprived sections. He went on to underscore how millions of new jobs have been created by the “Skill India” and the “Make in India” campaigns. Shah mentioned one scheme after another to underline Modi’s initiatives inlcudng the Smart City, Amrit-2022, to provide roof over each head, Deendayal Gram Jyoti scheme Digital India, Gas subsidy surrender, Atal pension Scheme, Accident Insurance Scheme on annual premium of Rs. 12, strict law to bring back black mnoney stashed abroad, Adarsh Gram Yojna, traditional Yoga Day, Prime Minister’s Irrigation scheme, “Swachch Bharat” (Clean India), “Namami Gange” (Clean Ganges), farmers’ relief schemes. All these initiatives have laid a solid foundation for building a strong India, the BJP president said adding the country’s growth graph has gone up, prices are now under control and the whole world is looking towards India. Shah had a word of praise for Madhya Pradesh where the growth rate is above 10% and agriculture growth continues to be 24%. This has been possible due to the good work of the State BJP government and party workers. Chhattisgarh has been heaped in poverty and hunger since Independence. The BJP Government in that state has ensured there is adequate in rice and wheat, iodised salt and kerosene in every house. In the entire world, only BJP can claim popular leadership since it is the only party with such a committed army of party workers.